It’s Thursday noon already! This column should have been written yesterday. Loretta and I have been cleaning the house this forenoon. Tonight men from church will come at 6:30 to practice singing church songs. We want to make some snacks for tonight yet. The laundry is waiting to be washed in the basement. Hopefully I can do that this afternoon. I guess if I don’t, it won’t run away for tomorrow. In the winter we just hang it on lines in the basement to dry until the next day. Daughter Verena, 18, is babysitting in town for two little boys. The mother had a new baby last night. Verena went yesterday and stayed all night with the boys so the father could stay at the hospital. She will come home tonight and go back again in the morning. The boys are four and almost two in age so she has her hands full. She loves children so the time goes fast for her. 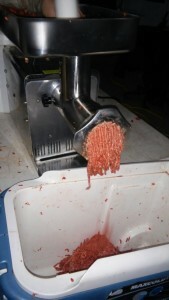 We have the beef all cut up but still need to grind some hamburger. We gave Timothy and Elizabeth two quarters. They came here the last two evenings to help cut up their two quarters. We were able to get their hamburger ground, steaks cut up, and beef chunks cut up. They took all their meat home although the beef chunks need to be processed in canning jars. 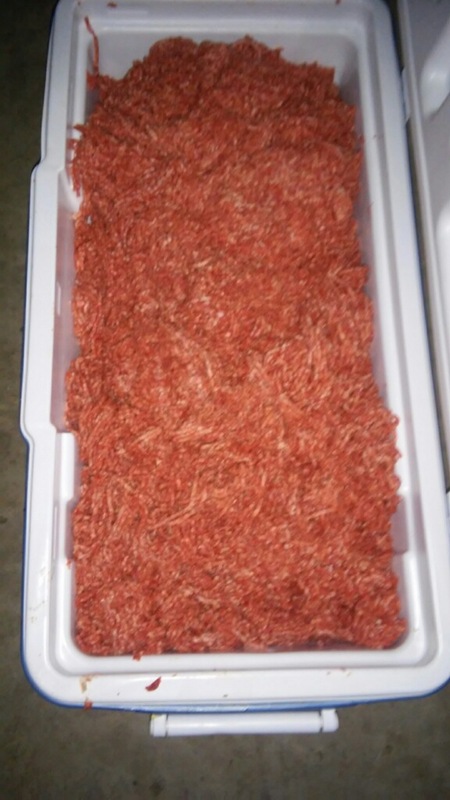 The hamburger will be bagged for the freezer. The new building came in handy to cup up all the beef. I have a gas stove in there too so we could make supper and eat out there. It takes so much of the mess out of the house. Our most favorite thing to have when we butcher beef is what we call “rare beef,” which I’ve written about before, but for newcomers, I’ll repeat! We slice the steak real thin and put salt and pepper on both sides of each slice. Then heat some oil until it’s really smoking hot. Take a fork and put in a slice, turn around the pan once, flip over and give another turn and take it out. I make it as the family eats it because that’s how it’s best—right out of the pan. It’s very tender. Elizabeth quit her job today so I’m looking forward to spending more time with her. We both want to can vegetable soup. 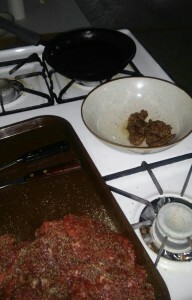 We cook the meat off the beef bones and add vegetables. 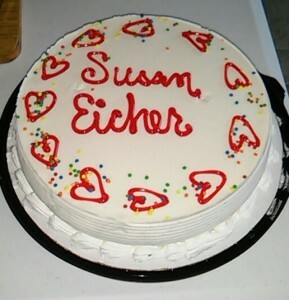 Daughter Susan had a nice birthday Sunday, January 24. She had a few friends over for supper. Her special friend Mose grilled hot wings and bought her a Dairy Queen ice cream cake. Susan made pizza casserole (one of her favorite foods). We also had salad, dressing, and cinnamon rolls. Our thoughts and prayers are with Joe’s Uncle Benji. He is in critical condition from suffering a brain aneurysm. My dad had an aneurysm on his brain right before he died. May God be with Aunt Margaret and the family through this trial in life. God is above all and can perform miracles but it isn’t always what we want. Uncle Benji will be 79 in May. Sauté hamburger and onion in a skillet. Drain. Stir in the rest of the ingredients and simmer for 15 minutes to one-half hour. If mixture is too juicy, sift in a small amount of flour while stirring vigorously. Serve in six to eight hamburger buns.